Anyways, I used to post a yearly roundup of quilts I’d made. But then I stopped making quilts for a while (it turns out that making a tiny human isn’t very compatible with projects that involve lots of sharp tools like rotary cutters and scissors). And then I pretty much stopped blogging. But, hey, look! Some stuff I made last year! These aren’t in any particular order, and the photos are all kinda crappy iPhones pictures. These days (when I have so much going on in my life), I consider making anything to be a pretty big accomplishment. Taking proper photos on top of all that is just bonkers. Lilian went through a really awful phase last fall where she completely and utterly freaked out about going to bed by herself. She would cry and cling to me and beg me not to leave her room. I started telling her stories about a mermaid named Felicia (our mom told us similar stories when we were little) that ended up being a bit of a guided meditation towards the end. In the stories, we always seemed to end up sleeping in a sand castle on the beach, under special mermaid blankets made out of seaweed and stardust. I made this quilt in the hopes that Lilian would sleep better under it (spoiler alert! it didn’t). The mermaid fabric is all from the Mendocino line by Heather Ross. It would have been a lot easier to sew if I’d had full widths of all the fabrics. Unfortunately, the only way I could get the full color-way was with a fat quarter bundle. So, each of those sections was sewed together separately. The quilting is all stars, and I used a silver metallic thread. I told Lilian it was stardust, and she was duly impressed. The quilt doesn’t seem to help her sleep any better, but she does refer to it as her special blanket. 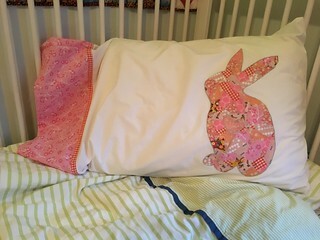 Lilian and I made this bunny pillow together. It uses this pattern for a scrappy appliqué. 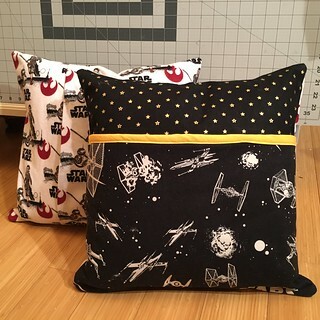 The designer (Shannon Brinkley) has a ton of different patterns that all use the same technique. You draw the pattern on two sides of a fabric, iron scraps onto it, then cut the whole thing out using the outline from the back. Then you appliqué the whole shebang onto something else. 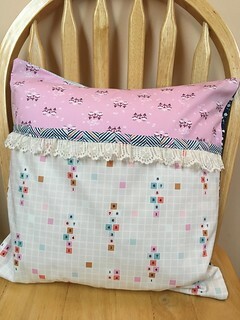 It’s a good project to do with children, because they can help you layer the fabrics together, and then you can do the final cutting and then sew it together after they go to bed. Of course, Lilian used a lot of teeny tiny scraps, which made for a lot of sewing after the fact. She loves her bunny, though, and she’s so proud of the fact that she helped me make it. I’m sure that you’re all shocked (shocked!) 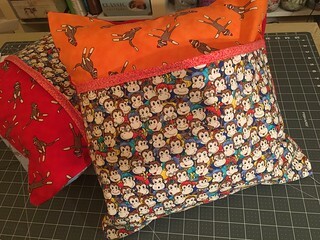 to find out that this is from the same pattern as the bunny pillow. The biggest difference is that I learned my lesson about teeny, tiny fabric pieces. I did a little more active management while Lilian was “helping,” and didn’t let her cut everything as small as the bunny fabrics. 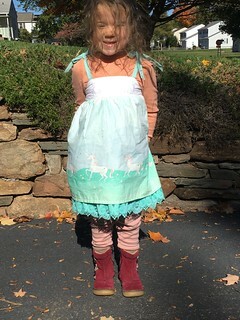 I could not, however, convince her to leave out the My Little Pony fabric. Which is why this pillow features a creepy horse-on-horse motif. I used a pre-made pillow case from Ikea for this one. I don’t know if it saved me that much time, though, because it was pretty tough to sew everything down inside something that’s already joined together. 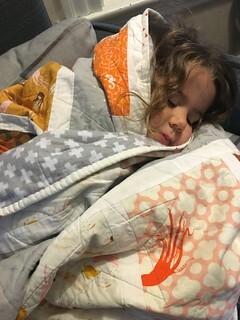 We started on a duvet cover from a third design in the pattern (a cat), but by the time I had it halfway sewed down, Lilian hit a growth spurt and outgrew her toddler bed. These are the risks I take when I sew things for someone who literally outgrows things overnight. 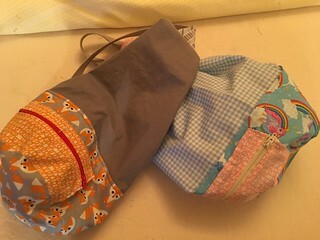 I didn’t get very good photos of these, but they’re cute little shoulder bags that I made to send to some friends who hosted us on our big trip to Seattle and Hawaii last year. One has foxes on it, the other one has unicorns and rainbows. I used this pattern, although I found it a little bit hard to follow (there are some formatting issues that make the measurements almost impossible to read). I also reject the idea that certain sewing projects are for girls and certain projects are for boys. Especially when it comes to something as basic as a bag. But I will get off my high horse long enough to say that they are pretty cute. This was a project from Happy Quilts! 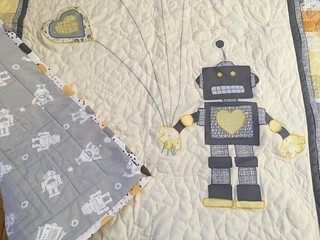 : 10 Fun, Kid-Themed Quilts and Coordinating Soft Toys (affiliate link) that I made for my cousin’s daughter. I didn’t quite grasp how large a quilt it made (measurements? who has time to read the measurements?!). It took a looooong time to sew. But I think it’s one of the nicer quilts I’ve made. I really love how the color combination came out. My cousin’s husband owns a garage and loves track days, so I liked making something that encapsulated his interests. In general, I think way too many baby gifts are aimed at moms and not dads. It was fun to make something that was for the whole family (my cousin helps out at the garage and is into cars as well). This is one of those projects you take a risk on, when you sew for someone who outgrows things overnight (see unfinished duvet cover, above). Lilian wore this dress once. And she complained the whole time I made her wear it. (Apparently lace is itchy and I am a monster). This picture doesn’t really do it justice. It just might be one of the nicest things I’ve ever sewed. It has these really lovely pleats with lace details on the bodice, and everything. Remind me to stop sewing garments for my daughter. 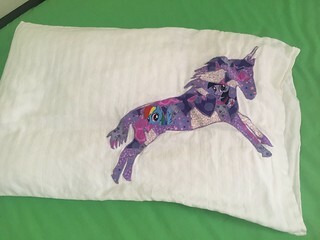 The unicorn fabric is from the Sarah Jane Magic fabric collection. I love this fabric so much it almost hurts. I made a couple of aprons from the same collection, but I never took photos of them. Whoops. Remember when I said I wasn’t sewing any more garments for my daughter? Yeah, I lied. Or maybe halloween costumes don’t count? Whatever. Lilian nearly broke my heart when she said she wanted some store-bought crap for Halloween. But then I made my peace with how much time it would save me. And theeeeen…. she said something about Hermione, and I pounced. (It turns out, I just really love making halloween costumes for her). (I ran into a teenager and her mother at Jo-Anns when I was buying the cloak fabric and it warmed the inner recesses of my heart to see an older girl who was still asking her mom for costume help). Most of the components were assembled from stuff I bought on Amazon. The tie is a yellow one that I added the maroon stripes to, using fabric paint and some painters tape. 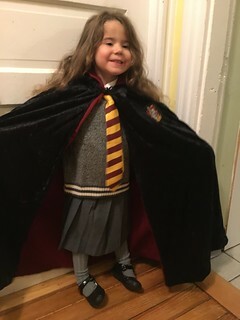 I sewed the cloak from scratch, because I am a glutton for punishment. The Gryffindor badge was an eBay find. Lilian called those glittery shoes her “Hermione Shoes” and then she literally wore them until the soles fell off. Hey look! I sewed something for myself! This dress looks kinda lumpy and shapeless in this photo, but it hangs much better off me. Besides, it’s super cozy and has pockets, so I kinda don’t care. I made a similar tunic and dress for myself, but they’re just not exciting enough to take photos of. This is the onesie that inspired me to ask Kristian for a Cricut cutter for Christmas. It turns out that iron-on material is realllllly hard to work with when your Cricut cutter (I had the original version) doesn’t have an option for cutting out mirror images. I ended up pulling the iron-on material off of the backing, adhering it to the cutting mat, cutting out out, pulling everything off, crying a little every time it rolled up on itself, and then I somehow managed to iron it all on. After the whole process was over, I had died a little bit on the inside and I then begged Kristian to upgrade my machine for Christmas. These pants are a mixture of scraps and more fabric from Sarah Jane Magic (this time in knits). I made these as a gift for my niece. Someday, she will be big enough to wear them. And then she will outgrow them before my sister has a chance to put them on her. I literally never learn. 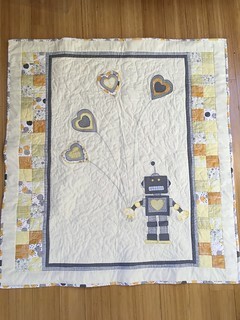 This was a wedding gift that took me so long to finish, I almost had to give it to my friend at her baby shower (see: Robot Quilt, below). It turns out that my friends have “I love you” and “I know” engraved on their wedding bands. I love it when things come together like that. 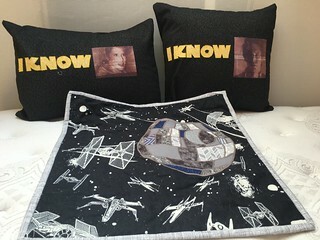 The wall hanging is a patchwork Death Star layered on top of some Star Wars fabric. Lilian, who thinks that everything I sew belongs to her, was slightly crushed when I wrapped it up and gave it to someone else. “Not everything mommy makes is for you” is a tough, but vitally important lesson. 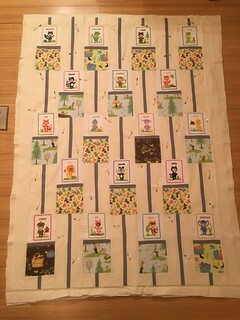 This is another pattern from Happy Quilts… sortof. 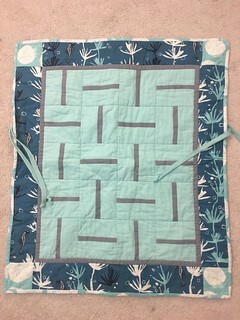 This time, I learned my lesson (for once) and used one piece of the appliqué pattern, instead of making the entire quilt. I made up my own pattern for the setting. It’s hard to tell from the photos, but the stitching on the balloon “strings” is the same metallic I used as stardust on Lilian’s mermaid quilt. I experimented with free-form quilting with this one. I don’t know that I was all-together successful with the free-form quilting… but hopefully it’s busy enough that you can’t see the janky parts. 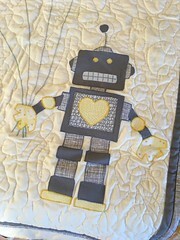 I loooove the robot flannel that I found for the back. I made these for my niece. It was supposed to be just one quilt… but then I miscalculated how much background fabric I would need… and couldn’t get my hands on any more of it (this is why I hoard fabric, people). I’d already done a ton of strip piecing, so I made up a pattern on the fly. 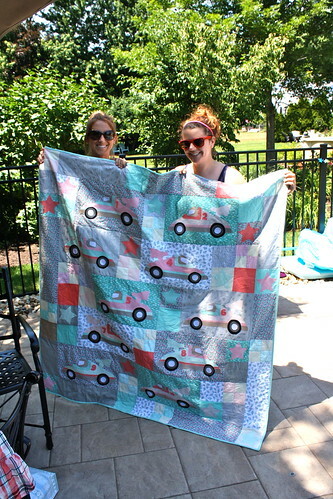 I sized the bonus quilt (and added some little ties to it) so that it could be tied on to Amy’s infant car seat. I should have taken more pictures of the details on the critter quilt. I ended up appliquéing the critters on (I didn’t think I’d have enough of a seam allowance to sew them into blocks the traditional way), and I tried out a bunch of the different fancy stitches on my sewing machine in sewing them down. I apparently never took any photos of the finished critter quilt, which was just plain silly of me. The white balance on this photo is absolutely horrific, but I already mailed these off to be drooled on. So what are you going to do? These were super easy to make and came out really cute. The tutorial I used makes it pretty easy to sew two of these at a time. These would make a great baby-shower gift. I got a little bit… obsessed with making these around Christmas. Which is how every single one of our younger nieces and nephews ended up getting one (even I couldn’t justify making them for teenagers and adults). I packaged them all up with a book and a flashlight and they were a surprising hit. 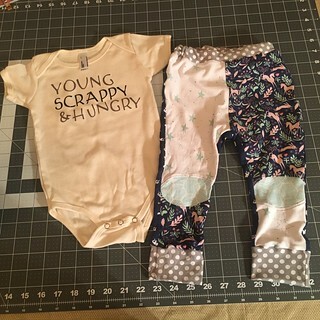 I used this pattern, and it’s so quick and easy to sew! I think I can whip one of these up in about an hour now. I’ve already made two more this year as birthday presents. 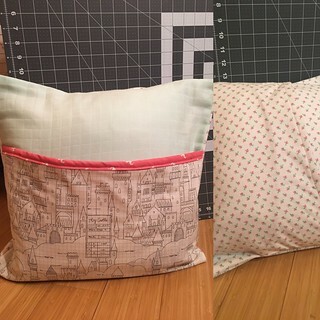 It’s a really fun way to combine a bunch of different fabrics, but in a bite-sized project. YACPFMN (Yet Another Craft Project For My Niece). 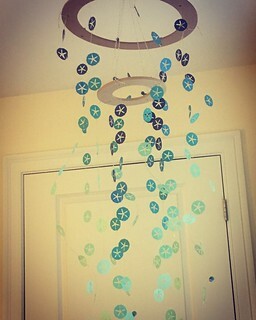 I made a similar one for Lilian’s room a few years ago, but hers has butterflies in oranges and reds. My sister says that my niece finds this one mesmerizing. I was rather mesmerized by it myself while I was working on it. I cut all of the sand dollars out individually with a paper punch. Now that I have the Cricut cutter, I could probably make something similar in a lot less time. The Cricut cutter wouldn’t save me from all the hot glue burns, though. This one is doubly ironic, because I accidentally made it using one of Kristian’s favorite sweatshirts. The man has the patience of a saint, and how do I reward it? By Ruining something he loves. I bet he was reallll glad he bought me that Cricut cutter. I like wearing it, however, even if I do feel a slight pang of guilt every time I pull it out of my closet. It’s pretty subtle in person. 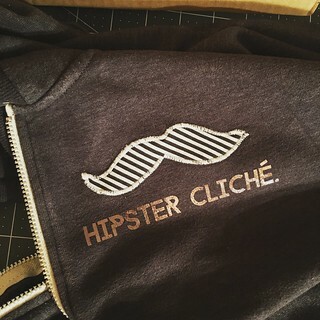 I used my cutter to cut out the mustache, then appliquéd it down the old-fashioned way. The lettering is metallic iron-on. I guess you could say it’s my first mixed-medium creation. So there you have it! I’m sure I made more things (I sewed a bunch of quilt blocks as part of the Splendid Sampler, but that will be a post on its own if I ever finish the whole sampler). I also made quite a few blocks for a quilt that I decided I hated and subsequently abandoned. 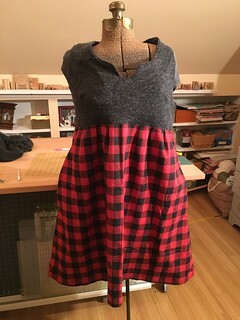 I made a half apron for another sister, but never took photos of that. And I made a delightful ugly sweater potholder for yet another another sister (so. many. sisters. ), but I finished it in January, so it doesn’t count. Thanks to a heads up from a friend that my site was throwing up database errors instead of posts, I just spent a good chunk of my Easter Sunday fixing this here blog. The ultimate solution? Open up a chat window and let my hosting company fix it. You know who suggested said easy fix? My long-suffering husband, who is clearly wiser than me in the ways of MySQL. When did he make said genius suggestion? Oh, at least an hour ago. Like I said, he is clearly wiser than me in oh so many ways. Well, the first answer is that it has about nine years of my personal history archived in it, which is no small matter. The second answer would appear to be that I still care about posting, even though I rarely sit down and, ya-know, post. So, hey, here’s a post. Maybe we could throw some real content in here as well? And maybe stop talking to yourself? Let’s not get ahead of ourselves here, people. Like I said earlier, it’s Easter weekend and we’re having a pretty low-key one. Lilian had her first ever sleep-over on Friday night… And I think we’re all still recovering from it. Lilian is now fast friends with a little girl who lives down the street from us. The two of them stayed up all night on Friday, reading and snuggling together. It was pretty much the cutest thing ever but nobody got much sleep (myself included). We’ve pretty much laid low since then, although we did make a trip out to procure an Easter dress. I don’t know what it is about Easter, but there’s something hardcoded into me but you must have a brand-new dress for the holiday. 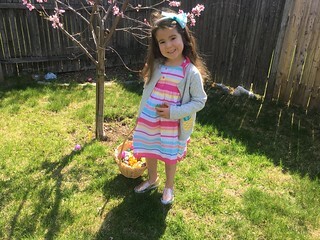 It probably has something to do with the fact that most of our clothes when we were little were hand-me-downs, but we always got a brand-new Easter dress. Lilian begged me for a hair-bow, which I begrudgingly let her buy… This ended up being a genius move, because then she actually let me brush her hair without screaming so loud the neighbors are all tempted to call child services on us. I think it took longer to brush her hair than it did for her to finish her Easter egg hunt. Let’s just say that none of us was particularly motivated to spend much time in the backyard when it was about 90 bazillion degrees out. Her chocolate frogs were literally melting. Such is my child’s devotion to the integrity of an outfit, she kept that sweater on until after she asked for her second glass of water in about a five minute span. 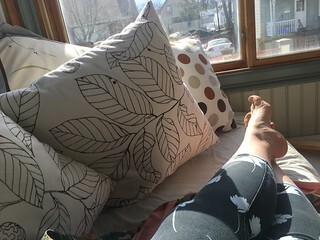 I spent a few hours yesterday cleaning up our sun porch. Which means that today is the semi-annual day where I can actually sit on our day bed and relax! Usually it’s covered in a heavy layer of dust, dog hair, and discarded auto parts. Lilian yelled at Kristian for leaving tires and tools on the porch when he was getting ready to put on everybody’s summer tires, so maybe there’s hope for us yet. It really is the most pleasant spot in the house to sit when it’s warm out. Lilian: Why did the pig cross the road? Me: What’s brown and sticky? Me: And chocolate ice cream? Lilian: Why did froggies jump across the road? Lilian: You have to tell me! Me: I’m pretty sure that’s not how jokes work. In short, it was a lovely little day. Low pressure, low key, lovely. The world might be going to hell in a hand-basket, but I’m glad that we all took some time today to say that we love each other. After the election, I felt hopeless and lost. It felt like we were about to step off of a cliff, and that some of the most vulnerable populations out there were going to get pushed off that cliff before us. I didn’t know what I could do, and (even from inside my coastal elite bubble) I felt totally alone. The march was so incredibly positive. The MBTA was completely packed, but everyone was so kind to each other. We all made room for each other, helped each other with our kids, talked and laughed together. Boston Common was so packed, you could barely walk anywhere, but folks just made space where they could. There were a few mean-spirited signs, but most of what we saw was positive and hopeful. Focusing really hard on teaching my daughter about compassion and understanding. We’ve always emphasized the importance of being kind and of looking out for other people, but there is so much more that I can teach her, and so many amazing people out there that I can introduce her to. The organizers of the women’s march have action items, and the first is sending postcards to your senators. We’re hosting a postcard making party at our house this weekend. Sometimes the best way to be helpful is by utilizing your most valuable skills, even if they don’t feel as immediate as direct action. I’m going to be looking for opportunities to help progressive organizations out with their tech problems. There’s a saying that it’s better to light a candle than to curse the darkness. 175,000 candles is a pretty impressive display of light.